Undervalued stocks with a predictable business originally published at long-term-investments.blogspot.com. 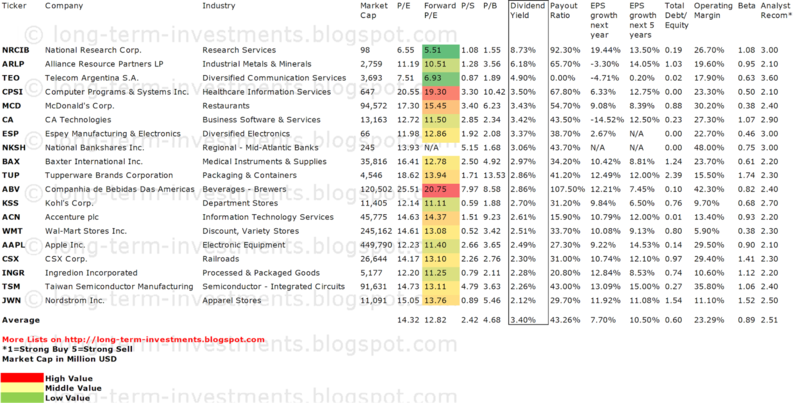 Today I would highlight you some of the top results from the gurufocus undervalued predictable screener. It’s a nice tool in my view to get fresh new investment ideas for long-term orientated dividend growth and value seeking investors as well. McDonald's Corporation (NYSE:MCD) has a market capitalization of $94.41 billion. The company employs 440,000 people, generates revenue of $27.567 billion and has a net income of $5.464 billion. McDonald's Corporation’s earnings before interest, taxes, depreciation and amortization (EBITDA) amounts to $9.865 billion. The EBITDA margin is 35.79 percent (the operating margin is 31.21 percent and the net profit margin 19.82 percent). Baxter International (NYSE:BAX) has a market capitalization of $35.80 billion. The company employs 51,000 people, generates revenue of $14.190 billion and has a net income of $2.326 billion. Baxter International’s earnings before interest, taxes, depreciation and amortization (EBITDA) amounts to $4.052 billion. The EBITDA margin is 28.56 percent (the operating margin is 20.36 percent and the net profit margin 16.39 percent). Tupperware Brands (NYSE:TUP) has a market capitalization of $4.49 billion. The company employs 13,000 people, generates revenue of $2.583 billion and has a net income of $193.00 million. Tupperware Brands’s earnings before interest, taxes, depreciation and amortization (EBITDA) amounts to $447.90 million. The EBITDA margin is 17.33 percent (the operating margin is 11.86 percent and the net profit margin 7.47 percent). Wal-Mart Stores (NYSE:WMT) has a market capitalization of $243.48 billion. The company employs 2,200,000 people, generates revenue of $469.162 billion and has a net income of $17.756 billion. Wal-Mart Stores’s earnings before interest, taxes, depreciation and amortization (EBITDA) amounts to $36.302 billion. The EBITDA margin is 7.74 percent (the operating margin is 5.93 percent and the net profit margin 3.78 percent). *I am long CA, TUP, BAX, CAN, WMT. 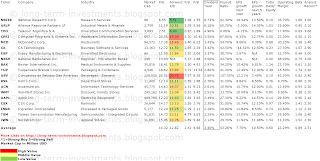 I receive no compensation to write about these specific stocks, sector or theme. I don't plan to increase or decrease positions or obligations within the next 72 hours.